Very helpful - thanks guys. Aegon - Thanks for letting me know what happens when you close the chassis battery disconnect switch for a few days. My chassis battery is steadily decaying with the disconnect closed, it’s down to 12.4V in < 24 hrs—I’m going to abort the test and open the switch again. I started the test at 12.7V with the coach stored outdoors in full sun. I’m concluding that the 10W chassis battery solar panel is insufficient to keep up with the parasitic drains on the system. Are you sure it is a "chassis battery" solar panel? I am not familiar with the newer units so I am asking. I believe the solar panel keeps the coach batterys charged if they are disconnected. 10 watt panel will produce at most .8 amp at noon, clear day and clean panel. Helps but not enough to keep battery topped off. In my opinion, if you are going to store an NA outside not plugged in, you need at least enough solar on the roof to cover chassis/coach base loads. In my NA the coach needs 3 amps 24X7 without the inverter on. I have not measured the parasitic loads on the chassis. In any event once you have enough solar on the roof, then you just keep the battery boost on when you put the coach in unpowered, outside storage. I just use a little piece of plastic under the switch to keep it bridged. Just push switch down then stick something under the front edge of the switch button so it would flip back. With 1kW of solar on the roof I can leave the coach outside, unplugged, bridged with the inverter on and refrigerator running indefinitely. All batteries will be topped off everyday in this configuration. Yup, I’m sure. I also have 400W for the coach batteries. Thanks for the tip, I’ll have to try that. I’m just trying different configurations to learn the different characteristics of the NA. I have 400W of solar available, so I’d certainly like to make the most of it. I'm not familiar with the relay used on your coach to bridge the battery banks, but I would think that the battery boost relay was intended/designed for temporary use and that forcing it closed with a stick for long term storage may shorten it's life or result in failure like over heating that may have ill effects on the coach. The NA has a Charge Bridge Solenoid. This is the only device on board, as far as I know, that bridges the coach and chassis battery. This is the same device that opens during driving to supply chassis DC to the coach batteries. This device is also connected to the SilverLeaf TM102 that opens and closes the bridge when the coach is hooked to shore power. When the coach is in storage, without shore power, but equipped with enough solar power on the roof, the solar controller will keep coach batteries charged. However, there is currently no interface for SilverLeaf which will allow the TM102 to open the bridge and simultaneously charge the chassis battery. The only current work around for this situation is to leave the charge bridge open when the coach is in storage. This will charge all batteries using the solar controller charge algorithms. Modern solar charge controllers, just like the Xantrex charger/inverter used for ground power hookups, is not going cause any harm to the chassis batteries. While this is not a perfect solution (perfect solution would be to have the TM102 control chassis battery charging just as it does when on shore power), I can think of only one thing worse for the chassis batteries: letting the chassis batteries continually go to total discharge while the coach is in storage. This would be the case if the Battery Boost Switch is not used in storage. Having said all that, I highly recommend any modern, all electric coach in long term storage should be continuously connected to shore power using solar/batteries for emergency backup. One more fact to consider with NA chassis battery discharge issues. It is not clear that shutting off the chassis battery switch will actually preserve the battery. There are two fused, hot leads that come directly off the chassis battery before the switch. So there is something continuously powered somewhere in the coach that retains battery power even when you open the chassis battery switch. Without a schematic diagram I don't know how to track it down. But it would appear the chassis battery drain could continue even with the chassis battery switch open. it would appear the chassis battery drain could continue even with the chassis battery switch open. 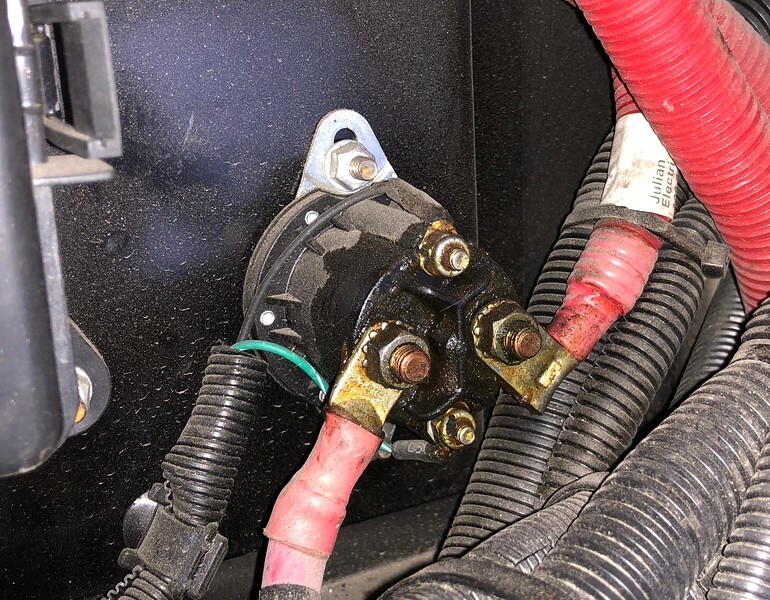 Our coach was in outdoor storage for 7 days w/chassis battery disconnect open. The battery voltage held steady at 12.7, most certainly aided by the 10W solar panel. Feel free to add to this list. I’ve only listed what I can prove 100%. There are two labelled FreightLiner fuse panels in the forward driver's side basement and one back by the chassis battery switch. So pretty easy to get a list of all the chassis battery circuits. The issue at hand is how many of these are "hot" (ie drawing current) without any switches on. Good data point. Lead acid batteries discharge around 5% of rated capacity per month. So somebody could run the math with some assumptions about solar panel efficiency. I would be surprised if a 10W solar panel could keep up with the self discharge rate alone over long periods. Thanks everyone - this conversation is useful. I’m just going to make it a habit to disconnect the chassis batteries if I’m leaving the coach vacant for more than a day or two until I can understand better. Aegon - Thanks for the beginnings of your list. I started the same process today too. My memory from reading the Freightliner manual (not presently available) is that the power from the chassis batteries to the starter is not routed through the cutoff switch.